The introduction of new technology into a business’s strategic plan is a simultaneously exciting and daunting idea for many stakeholders. The newer the tech, the more uncertain the ROI is and the more unwilling risk-averse decision makers might be to implementing it. However, there is some truth to the notion that with great risk comes great reward. Few businesses have successfully capitalized on the opportunities chatbots and voice interfaces afford, so being one of the first to do so in any given industry has the potential to produce monumental returns. Conversational marketing is a new strategy that leverages the popularity and immediacy of messaging channels. It enables brands to engage with an audience through one-on-one conversational interactions. Marketers can deliver content and send notifications automatically through popular messaging channels such as Facebook Messenger to build their brand and move consumers down the sales funnel. As more people adopt messaging as their preferred method of communication, brands must shift marketing tactics to reach their audience. I make a case for conversational marketing in a previous blog post; it’s on track to replace, or at the very least supplement, most brands’ email marketing strategy in the near future. Voice-first devices, such as Amazon Alexa or Google Home, offer other relatively unexplored opportunities for conversational marketing. Consumers’ rapid adoption of this technology has created a unique and uncrowded space for brands to enter. Brands like Tide and Johnnie Walker are already taking advantage of the devices’ hands-free, ubiquitous nature. Voice search is also on the rise. Marketers must consider voice SEO and how it might impact a website’s overall ranking. Using structured data, improving featured snippet text, and altering or creating content to connect with users’ queries should all be on marketers’ website voice search optimization list. Conversational commerce is how businesses sell products and services as well as transact through messaging platforms. Conversational interfaces enable companies of all sizes to offer automated, concierge-like experiences for consumers as they shop online. Consumers are more likely to make purchases from businesses that offer live-chat assistance. However, staffing a human support team 24/7 is very costly for businesses. Companies can use conversational interfaces to automate conversations that assist consumers in making purchase decisions and convert them to customers — interactions that were previously unsustainable to support for most businesses. Now that conversational interfaces have integrated payment into platforms so consumers can pay for something at the click of the button or via voice command, it won’t be long until the majority of people prefer the convenience of conversational commerce over other shopping methods. By looking at the success of retailers like Amazon and Apple in the digital marketplace, it’s clear the businesses that offer consumers easy, intuitive purchasing options will increase their market share and revenue exponentially. Conversational support is the automated way businesses assist customers or users via a messaging platform. Similar to conversational commerce, conversational support enables any company to offer practical guidance and help around the clock. People frequently pose the same questions to a business’s support professionals. Conversational support interfaces allow those people seeking help to interact with a company in a conversational manner and find the answers they need, whenever they need them, without human interaction. This satisfies situations in which searching for answers on a company’s website is too cumbersome and frees up support staff for more complicated queries. According to the 2017 Aspect Consumer Experience Index, 59% of consumers prefer customer service options like chatbots that do not involve talking. The key takeaway for any business owner with large support staff is that implementing a conversational support solution cannot only significantly decrease company overhead, but also better satisfy customers. Conversational consumer applications are a way for businesses to make complex web interfaces easier to understand and use via natural language. When people approach an app, they have an idea of what they need to do – an intent. Conversational apps take on more work to help users find what they need and accomplish their intent using natural language instead of relying on them to navigate through a highly visual interface. The market indicates consumers are experiencing application fatigue; they are downloading and engaging with fewer apps than ever. Therefore, it is vital for businesses to make their app as easy and delightful to use as possible. With 1.3 billion Facebook Messenger users and over 33 million voice-first devices in homes around the world, it is necessary for companies to determine how to embrace the conversational trend. Businesses can integrate their existing apps with conversational apps that users already have installed like Facebook Messenger, add conversational interfaces to their existing apps, or create brand new conversational apps to satisfy users. Conversational enterprise applications integrate within companies’ chat applications such as Slack, HipChat, and Microsoft Teams. These interfaces help organizations increase productivity and enhance communication between employees, external teams, clients, and vendors by automating repetitive tasks and information delivery. People are beginning to spend more time conducting work within chat apps than via email. The widespread use of this technology means there is a huge opportunity to help people better communicate through these channels. Streamlining a business’s internal communication can increase employee efficiency and promote effective collaboration. For workplaces that use chat apps regularly, investing in a conversational enterprise app might have a greater return than investing in one that’s consumer-facing. 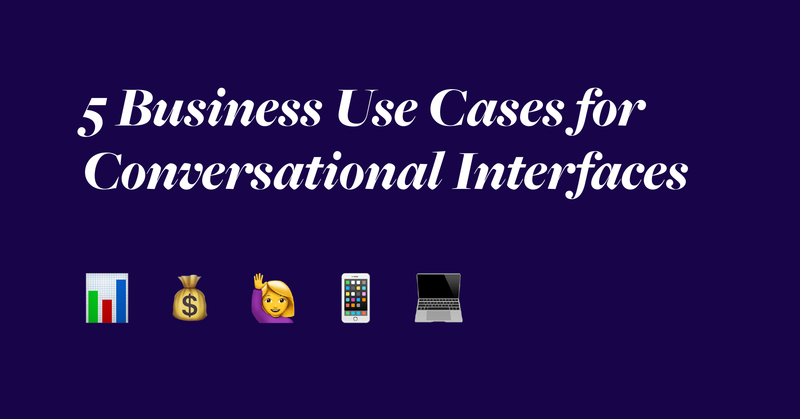 Conversational interfaces have the potential to affect almost every aspect of business and understanding their many uses is the first step to building a comprehensive conversational strategy.